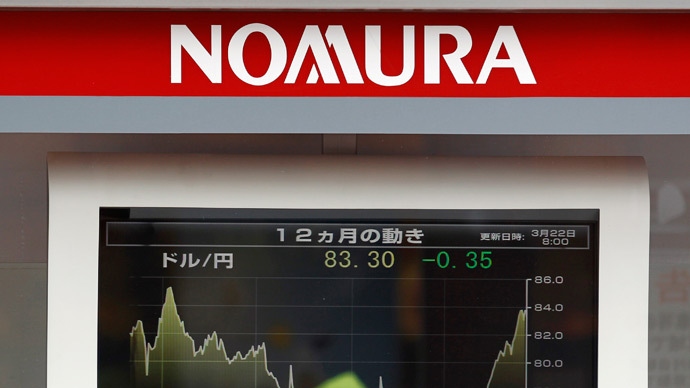 Italian police are holding around $2.3 billion destined for the Japanese bank Nomura because its former European branch chief is being investigated over an alleged derivatives fraud with the Italian lender Monte dei Paschi. The prosecutor's office in Siena, the hometown of the world’s oldest bank Monte dei Paschi, ordered the freezing of "a total of around 1.8 billion euros from Nomura International”, AFP reports. Former head of Nomura for Europe, Middle East and Africa Sadeq Sayeed as well as Monte dei Paschi’s managing director for fixed income sales Raffaele Ricci are under investigation. The prosecutor's office said Sayeed and Ricci were suspected of "gravely obstructing" the activities of supervisory authorities and putting out "false statements". Prosecutors also seized a total of 14.4 million euros from three former managers of the troubled Italian bank, who are also under investigation. Italy's third biggest bank has been rocked by the scandal over the non-transparent derivatives connected to the costly 2007 acquisition of its rival Banca Antonveneta. The involvement of Nomura is being investigated. Last month, David Rossi a spokesman of Monte Paschi di Siena was found dead at the bank's Siena headquarters after apparently committing suicide.